Normally, the range of diamonds is based on the absence of color and are described using the D to Z color grading scale. The diamonds that exhibits a more intense yellow or brown than Z color grading scale are considered Fancy Color Diamonds. With only one out of ten thousand, there are extremely rare diamonds that possess natural color. Unlike colorless diamonds, fancy colored diamonds also have grade up face. The strength of color is the most important factors in determining the value of a naturally colored diamond. The value of fancy diamonds increases with the strength and purity of the most prominent hue within the stone. 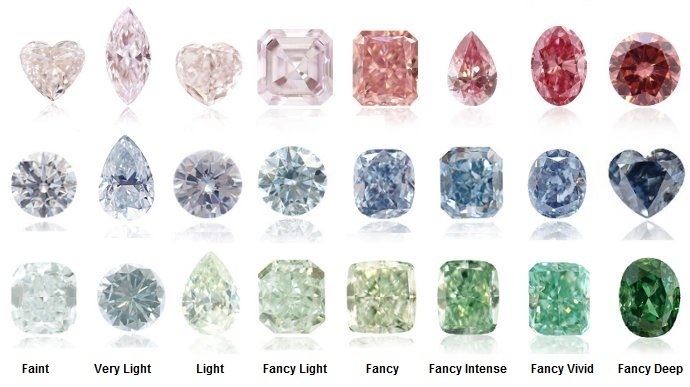 Fancy diamonds are rarest and come in every color of the spectrum including saturated pinks, blues, and greens. Even a slight color difference in diamonds can have a big impact on values. Red diamonds are the rarest and costly fancy colored diamonds. However, Not all fancy color diamonds have high prices. Fancy yellows and browns diamonds are less desirable and considered less valuable than the rarer colors.